Deaf dog: Echo, a miniature Australian Shepherd puppy. Echo is a feisty, loving pup who accompanies her mom, a chiropractor, to work and soothes patients. We are involved in agility training with Echo using hand signals only of course. She is excelling!! We recently adopted a second deaf mini Aussie(from Aussie rescue)! !She is 8 months old and a true joy. We named her Nefe (pronounced Neffy). The name is short for Nefertiti, the Egyptian queen. Her name means *the beautiful one has arrived*!! Our original deaf mini, Echo, loves her to pieces! Two peas in a pod!! Update(2003) We have now moved to Prunedale and have added a doggie to our already happy household!! 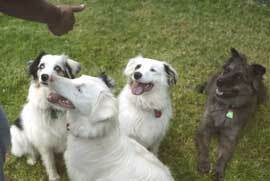 An article was recently written about our *herd* of deaf dogs in the San Jose Mercury Newspaper. Click here to read the article. Also, Echo was featured in Whole Dog Journal's recent article on deaf dogs...she was going over an agility jump with a smile on her face!! Other pets: Hawi, an Aussie mix who was named after the turnaround point for the Ironman Triathalon.